Originally posted May 3, 2007 on our old Vox blog. Scott and I get asked this question a lot, and really, there are two answers. The first answer is that we prayed through our decision and really felt God leading us towards Vietnam. While we were making our decision, there were several things we looked at when weighing the options each country presented. We looked at nine different countries – China, Colombia, Ethiopia, Guatemala, Kazakhstan, Mexico, Ukraine, Russia, and Vietnam. For China, you had to be at least 30 years old, so that country was automatically out. Some countries like Kazakhstan and Ukraine required a longer international trip that we thought we could manage. Others, like Russia, involved two international trips which we weren’t sure we could do. Guatemala had some adoption laws that were going to change soon, and we didn’t want to get caught in the middle of it. When the time came down to decide what we thought would make a good fit, we looked at the overall length of the adoption process, the amount of time spent in the country, and the age of the child. We ended up picking Vietnam because it was a “short” adoption process. The first Vietnam placement took about a year, but now it will probably take a year and a half (which is just a guestimate, we’re not really sure). We did know that some countries’ adoption process took two years. Also, we thought we could handle the three week trip to Vietnam to pick up our infant. Infant was the key word in that phrase. Luckily, I now work for a preschool, and I learned that an infant is a child up to 18 months old. We think our child will be twelve months old or less. We don’t really have any guarantees, so we’ll see how everything plays out. This is really a difficult question because it’s asking for private information. We don’t really feel like cost is something we should discuss. Scott came up with the best answer, “It costs enough for us to have to be serious about adopting.” Meaning it’s not something you would take on lightly. Well, fortunately I am a teacher, and I finish teaching at 3:30 pm. I am able to work in the after school program at my school, and I am also going to teach summer school this summer. This is in addition to what we already have saved and continue to save each month. Also, there are adoption loans and grants. We have looked into this a little bit, but we haven’t made any decisions about it or what we would use. We’re just taking things as they come. There’s not much sense in stressing over things because the process is what it is, and we have to go through all the steps. Now, I say this, but I can’t promise you that I never stress out. Scott, on the other hand, is more laid back in general, and it’s a little easier for him to handle the ambiguity than I. But we knew it would be this way, so we just take everything as it comes. Originally posted May 1, 2007 on our old Vox blog. What made you decide to adopt? A serious of events happened before we made the decision to adopt. Sometime in the month of August 2006, we discussed the idea of adopting with friends one Saturday night, and then the next Sunday at church the guest speaker was from Children’s Hope Chest which is an organization involved in orphan care and outreach. (You can visit this organization at http://www.hopechest.org). After hearing this speaker, we decided to research the possibility of adopting. We got some information and just started talking about adoption. We didn’t know much about it which led us to an even at Irving Bible Church called “Adoption Myths and Realities,” which was put on by the Tapestry Adoption Ministry. Tapestry is a community of foster and adoptive parents that support and encourage each other. (They have a website, too. http://tapestry.irvingbible.org). Attending this event gave us a lot of information and put us in contact with people who were “veterans” at the adoption process. I say “veterans” because no one adoption process is exactly the same, but still they could help us maneuver these new waters. After this event, we started looking into agencies and countries. We started to pray (not that we hadn’t already been praying). We spent time deciding as individuals how we felt God leading us. We didn’t want one of us to influence the other, but let’s be honest if someone was going to push someone it was going to be me (Annie). I can be a little impatient; Scott, however, has no problem taking his time. Nevertheless, I set a deadline of Christmas 2006 for us to know where we were headed with our family. Scott and I picked an agency and a country. We signed up for an Informational Session with the agency. The meeting was in December, so we were on track for our deadline. But, the session got canceled due to lack of interest; I guess Scott and I were the only ones interested. We felt a little dejected after that. Concurrently, one of the couples from the Tapestry Ministry invited us over for dinner to discuss where we were in regards to adoption. We met with the couple, and we told them about our canceled Informational Session. We also told them that we had reached the decision to adopt. 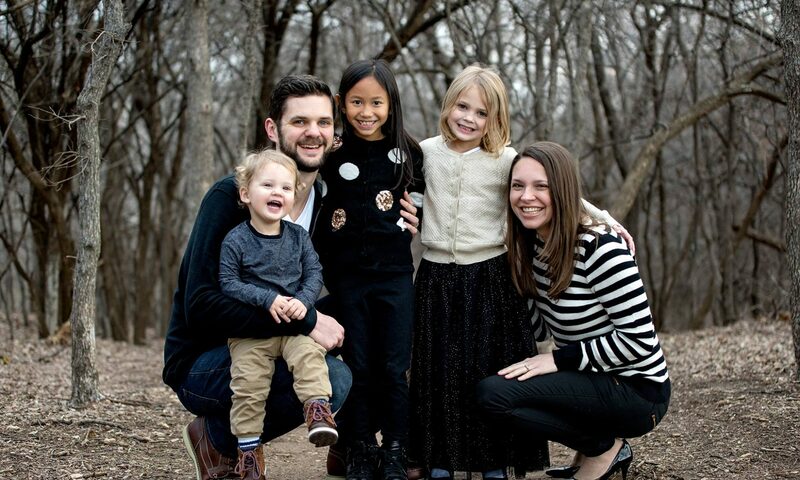 We felt God calling us to start our family through adoption. The couple we met with suggested we look into another agency that dealt with the country we were considering. We took their advice and ended up signing up for an Information Session with the Gladney Agency. The session was scheduled for January 2007. While waiting for our session, we had discussed our decision with our families over Christmas, and we assured them that we would have more information after our January session. January comes and so does the ice. Our session got canceled, again, but this time because of weather. So, we signed up for another session with Gladney in February. Finally, we got to the Informational Session, and we got so much information that we were now leaning towards a different country. We began to prayerfully considered the countries we felt led to. Scott was led one way, and I another. We also discussed the two countries with our families to see what kind of feedback we got from them. Then, finally, right before my spring break in March, we decided on Vietnam. After deciding on Vietnam, we could begin our official adoption process. We contacted the agency to let them know that we had picked a country, and then we were led through an overview of the adoption process for Vietnam. Next, we filled out an informational sheet to request our 50 page application. So, now six months later, what began as a conversation back in August is being lived out. Originally posted April 12, 2007 on our old Vox blog. First of all, I’m sorry I don’t post more often. It seems that time flies when you’re having fun or when you’re just really busy. Next, I’m sorry that I temporarily lost our birth certificates, which are necessary when applying for a passport. For some reason I thought it would be a good idea to absentmindedly send our original birth certificates and photocopies of said birth certificates to Immigration (Oklahoma City via Dallas). That derailed Annie’s plans of applying for our passports on Good Friday when we were both off of work. Now we find ourselves with our original birth certificates returned to us along with backup copies we ordered in the mean time. Annie went ahead and did her passport stuff on Monday, leaving me to drop by the post office on my lunch hour someday soon. The 50-page application still looms large, although our physicals went well, which means that part of application is taken care of (about 4 pages worth). That’s all for now… is a new post coming this weekend? Definitely maybe. Do We Look Healthy To You? Originally posted April 3, 2007 on our old Vox blog. Good looking? You betcha. Healthy? We’ll find out on Friday. Part of the 50-pager we are working on involves us getting physicals and our doctor filling out some paperwork. Hopefully he will verify, in his medical opinion, that we are (physically) fit to be parents. Doesn’t that mostly involve giving fake horseback rides and saying “because I said so”? On Friday we will also start the passport application process – so check those things off the list if you are scoring at home. Also, for further insight into the government, we received notice in the mail that all of the stuff we sent to the USCIS Dallas office has been forwarded to the Oklahoma City office for some reason. Good to know I suppose, but somewhat puzzling. Anyway, that’s the news for now. Thanks for stopping by! Originally posted March 28, 2007 on our old Vox blog. Last night we dropped our completed I-600A and a few other documents into the FedEx dropbox bound for the U.S. Citizenship & Immigration Services office here in Dallas. It turns out that when you plan on bringing someone from another country into your family, and by extension into the U.S., the federal government wants to know about it well in advance. This is understandable, especially considering the fact that we are counting on the federal government to make the child a citizen. Isn’t that nice of our government? We think so, and in light of that we are willing to send them a form, some birth certificates, a marriage license and a couple of money orders for processing and fingerprint checking (it turns out the federal government also wants to run a few background checks on anyone who says they want to bring the aforementioned someone into the country). At any rate, it feels nice to have that first little chunk of paperwork submitted. At least until they call us and tell us we did something wrong, or a form is missing, or my (Scott’s) handwriting in completely illegible. In the mean time, we’ll gladly turn our attention to whatever is next on the list. Originally posted March 22, 2007 on our old Vox blog. Our adoption process is officially underway. It is nice to be able to say that after so many months of thinking and talking about getting started. Early last week we had a phone orientation with our agency, Gladney Center for Adoption. The woman who conducted the orientation was very nice and walked us through the major steps of the process. From this point on, the majority of the paperwork process is initiated by us, so we’ve got a ton of work to do. The complicated bureaucracy driving the paperwork process became evident to me in two things. First, there is a 53-page orientation manual that comes with the phone orientation. Second, our first step was fill out a 2-page application to our agency. This application isn’t the application, merely the application to receive the application. We received the application via email earlier this week, and as I went to print it off I couldn’t help but marvel at it’s 54 pages. In the mean time, we we are working on a form and some documentation for Immigration, which seem relatively uncomplicated at this point. We hope to have that stuff submitted by the weekend so that we can focus on getting the 54-pager filled out and submitted to Gladney. So that is where we are right now, and that is what we are working on. As I mentioned in the Welcome post, we will do our best to keep you posted. Welcome to our (old) blog! Orignally posted March 17, 2007 on our old Vox blog. Over the next year or so, we will use this blog to share our experiences as we go through the process of adopting a child from Vietnam. From the time we first made the decision to adopt, we felt like a blog would be a great way to keep everyone posted on where we are in the process. Not that we don’t want you to check in with us personally, but please feel free to stop by the blog any time to see what’s new. Along the way we’ll try to update the blog as often as possible with news about what we’re up to, as well as with photos and such. Check back soon, hopefully this space will start taking shape.